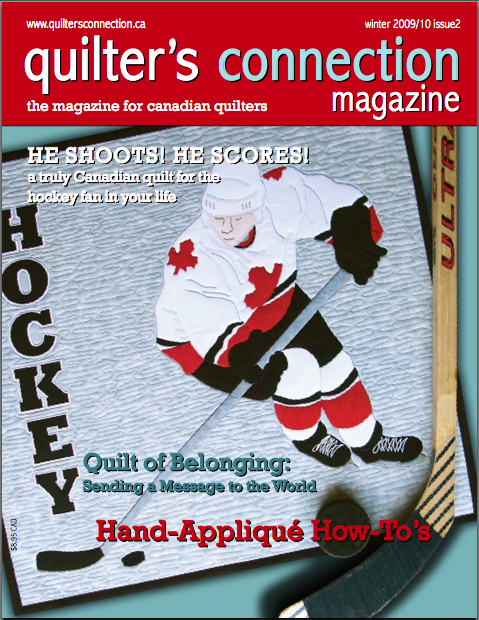 Hi everyone, I just received the new Addition of Quilters Connection Magazine and I must give a shout out to Heather, “Great Job! !” I read it from cover to cover and wanted more 😉 For those of you who are from far and wide reading my blog like Rachel D may not totally get us Canadians and our love for Hockey and winter nights but then again you may love it as much as we do! My cotton thread cones have also been featured under their “Favourite Finds” section I’m so excited!! My first magazine spotlight!! I have one available to WIN, so to WIN what you need to do is send me your favourite Christmas storey. Tell me something about when you were a kid and your strongest memory of what Christmas was to you and your family. Also, for all of you readers who feel shy to leave a comment, please just for this one time even, leave your storey for all of us to read. For me, it was hunting through the wilderness searching for the “best” tree we could find with my Grandpa. All of us Grandkids trudging through the snow…seems like we picked every tree…but Grandpa always got final say :). We would decorate it as a family listening to Christmas Music – great memories. I’ll draw the winner Monday December 14th. Thanks so much for all of your support and comments with my other blog postings as I love the feedback. Oh my … look at that cover!!! I’ve been eagerly checking the mailbox each day. Hopefully tomorrow. I hope that hockey quilt isn’t too difficult because I want to make it, one for me, one for my dad and one for my grandma .. she’s the biggest hockey fan ever. My favorite Christmas story goes back to when I was attending my first school. It was a one-room schoolhouse with grades one through nine. The front of the school where the teacher’s desk normally sat was transformed into a small stage for our Christmas concert complete with a curtain hung from a wire across the room. Different grades or groups of grades had their own parts to perform. I can still remember the "older" kids doing Frosty the Snowman… where frosty was a girl dressed in white long-johns stuffed with pillows. Not sure how all the families fit into that small building, but they did and we had a wonderful time. There were always ‘bags’ for the kids filled with a Christmas orange, hard candy and peanuts. It was the best treat ever!! I miss those simpler times…. Thanks for the great idea Val!! Merry Christmas!! Hi Edna, thanks for this great Christmas story. I do remember simpler times also even though I grew up in the 70s I love having humble moments in life and when life doesn’t become too busy or commercialized. That is definitely a memory to cherish. Thanks for commenting..so far your odds will be pretty good you will WIN!! Hi Vivian, thanks for sharing this story and yes it would be one that would stick in my head also lol. I’ll put your name into the draw and keep up the good work on your blog as I LOVE it!